Concrete Garage Repair, Refurbishment, Revamp and Extension. We specialise in the removal of asbestos or bonded fibre-cement corrugated roofing and we recommend its replacement with a tested and durable steel plastisol coated box profile sheet. We only specify sheets which include a condensation inhibiting layer (excludes ridge tile) and the components come with a 10yr manufacturers warranty. See our photo gallery for examples of our work. Often it is necessary to replace the fascias in conjunction with garage repairs, on a pent/roof roof concrete garage this may include front and side barge boards and we would typically use a matching steel plastisol, designed to suit an individual application. For the apex models we can rebuilt in timber or PVCu. Unless you want your building extended or widening we would normally retain your current roofing supports. Lidgetspares.com operates nationwide and in the majority of cases we can provide a fixed price quotation without the need for a survey simply provide with answers to the follow questions, do please email us photographs of your building. Q1. Do you know the maker/brand of your current building? Q2. What is your postcode/post town? Q3. Is your building flat or apex design? Q4. Do you require a replacement roof? Do you wish us to quote for fascias also? Are you looking to have your building extended? Q5. Do you suspect that your current roof is asbestos type? Q6. What size is your current building? We are often asked to convert a pent/flat roof garage to an apex design. Just as long as your building is spar wall (pebbledash) finish and you know the brand of buildings then we will be pleased to quote. Ideally we require either a copy of the original sales documents or a combination of external width x length plus photographs in order to provide you with a fixed price quotation. Non drip galvanised pre painted profile sheet in a leathergrain embossed Plastisol 200 microns thick, heat coated on the reverse side with an unwoven fabric which regulates condensation. 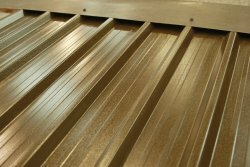 Our steel plastisol sheets are supplied in a variety of aesthetically pleasing colours, the pent roof designs can have matching fascias too. Complete this form to receive a fixed price quotation for your garage roof repair or garage refurbishment. Please can you describe the type of work you require? What is the size of your current building?